Shear Comfort Pressure Care Boots are the solution for people who have just had foot surgery or have toe problems. The open toe allows for easy toe observation and foot care. 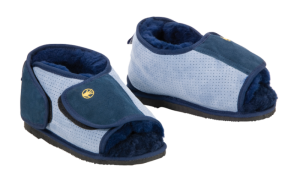 Made from Australian Medical Sheepskin and designed by orthopedic specialists. The rubber sole allows for use in and out of doors. Next Post: High Fibre Density Wool products for Pressure Sore Prevention.